Description: Mallee to 5 m high; bark smooth throughout, grey-brown, bronze and dark grey, shedding in ribbons. Juvenile leaves disjunct, lanceolate, blue-green, dull. Adult leaves disjunct, lanceolate, 5–11 cm long, 0.9–1.8 cm wide, yellow-green, glossy, concolorous. Umbellasters 7-flowered; peduncle terete, 4–7 mm long; pedicels terete, 1–3 mm long. Buds ovoid, 4–6 mm long, 2–3 mm diam., scar absent; calyptra conical or hemispherical, half to about as long as and as wide as hypanthium. All stamens fertile. Fruit cup-shaped, 3–5 mm long, 3–5 mm diam. ; disc steeply depressed; valves enclosed, strongly raised. 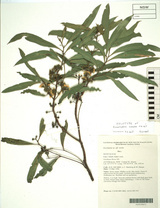 Distribution and occurrence: Locally dominant but restricted, in small stands on shallow soils on higher flanks of low sandstone ridges; known only from the Goulburn R. N.P.